NEEDHAM JK Lieutenant Commander (E) - HMS MAIDSTONE 16 Jun 1955 27 17 Jun 1955: The Royal Navy diesel submarine HMS Sidon sinks after a torpedo explosion in the forward torpedo compartment while the ship is in Portland harbour, U.K., killing 13. PAIN Alfred William Electrical Artificer First Class P/M 36343 HMS VERNON 12 Nov 1939 38 Son of Emily Pain, and stepson of John Walford; husband of Emily Edwina Pain, of Southsea, Hampshire. C. of E. Portion. PALMER Albert Private 17755 3rd Battalion, King's Own Scottish Borderers 10 Apr 1915 41 Husband of Elizabeth Eliza Ann Palmer, of 6, Grove Place, Whitehouse St., Hunslet, Leeds. PARR R Ordinary Seaman SS/4543(PO) HMS VICTORY 14 Nov 1914 33 Noted as "Buried near this spot"
PEAKE RH Marine Engineering Mechanic PSKX 880829 HMS/M SIDON 16 Jun 1955 22 17 Jun 1955: The Royal Navy diesel submarine HMS Sidon sinks after a torpedo explosion in the forward torpedo compartment while the ship is in Portland harbour, U.K., killing 13. PITCAIRN Colin Mackenzie Commander RD RNR - HMS BOSCAWEN 12 Apr 1940 46 Son of Charles Dalbiac Pitcairn and of Helen Mary Whyte Pitcairn (nee Mackenzie); husband of Emily Gwendoline Mary Pitcairn (nee McRae), of Wedmore, Somerset. C. of E. Portion. RATTRAY Norman McLeod Engineer Sub Lieutenant, Royal Naval Reserve - HMS RESEARCH 21 Jul 1918 31 Son of Capt. H. and Mrs. Catherine McLeod Rattray, of 42, Strathmartine Rd., Dundee. RAY Albert George Ship's Steward - HMS BOSCAWEN 27 May 1904 37 Church of England: body taken to Portsmouth by relatives. REILLY George Ordinary Seaman, RNVR Clyde Z/3415 RN Division (2nd Reserve Battalion) 28 Apr 1915 21 Son of William J. and Deborah Reilly, of 75, John St., Aberdeen. RHODES CE AM - Surgeon Lieutenant RNVR 16 Jun 1955 27 17 Jun 1955: The Royal Navy diesel submarine HMS Sidon sinks after a torpedo explosion in the forward torpedo compartment while the ship is in Portland harbour, U.K., killing 13. RICE PJW Acting Leading Cook (S) PMX 807734 HMS/M SIDON 16 Jun 1955 26 17 Jun 1955: The Royal Navy diesel submarine HMS Sidon sinks after a torpedo explosion in the forward torpedo compartment while the ship is in Portland harbour, U.K., killing 13. ROWE George Moore Alexander Commander RN - HMS CONQUEROR 30 Apr 1920 37 As the result of an accident on Boot Hill, Weymouth. Son of George William Rowe (Solicitor), of 28, Lincoln's Inn Fields, London. RYCROFT JMW Lieutenant - HMS/M SIDON 16 Jun 1955 23 17 Jun 55: The Royal Navy diesel submarine HMS Sidon sinks after a torpedo explosion in the forward torpedo compartment while the ship is in Portland harbour, U.K., killing 13. SEYMOUR Leonard George Ordinary Seaman P/JX 172726 HMS FOYLEBANK 04 Jul 1940 21 Son of George Andrew and Gertrude Ida Seymour, of South Norwood, Surrey. C. of E. Portion. SMEETON James (John) Yeoman of Signals 130622 HMS RESEARCH 15 Jan 1918 49 (RFR/PO/A/3271). Husband of Ada Hallett (formerly Smeeton) of 20, Mallams, Portland. Born at Derby. SMITH Colin Leading Cook (S) PMX 912901 HMS/M SIDON 16 Jun 1955 20 17 Jun 55: The Royal Navy diesel submarine HMS Sidon sinks after a torpedo explosion in the forward torpedo compartment while the ship is in Portland harbour, U.K., killing 13. STEPHENSON John D Chief Petty Officer Sick Berth P/M 417 Royal Navy 27 Feb 1943 54 Son of George and Margaret Stephenson; husband of Margaret Louise Stephenson, of Billingham, Co. Durham. SUNDERLAND JR Steward PSLX 901679 HMS/M SIDON 16 Jun 1955 24 17 Jun 1955: The Royal Navy diesel submarine HMS Sidon sinks after a torpedo explosion in the forward torpedo compartment while the ship is in Portland harbour, U.K., killing 13. SUTTON Charles Able Seaman 185901 HMS MARS 14 Dec 1914 35 (RFR/CH/B.5956). Son of George and Elizabeth Sutton; husband of Jennie Sheaf (formerly Sutton), of 11, Regent St., Ipswich. Born at Brough, Hull. THOMPSON Thomas Paling Able Seaman RNVR Bristol Z/3955 HMS PRESIDENT III 22 Jul 1917 31 Son of John William and Mary Alice Thompson (nee Paling). Born at Derby. TIBUSCH Paul - - - - - Born 15 May 1916 - Died 8 May 1941 - A Luftwaffe airman? VICKARY Leonard - - - 28 May 1936 - Of Married Quarters - Age 8 months ? WAITE DP Able Seaman PSSX 835715 HMS/M SIDON 16 Jun 1955 23 17 Jun 1955: The Royal Navy diesel submarine HMS Sidon sinks after a torpedo explosion in the forward torpedo compartment while the ship is in Portland harbour, U.K., killing 13. WARTSKI Harry Boy 1st Class - HMS BOSCAWEN 17 Jun 1898 16 Cancelled: body taken by friends. WARWAS Franz - - - - - Borne 30 Dec 1916 - Died 5 Sep 1942 - A Luftwaffe airman? WELLINGTON William H Stoker 2nd Class K/21248 RN Division (Anson Battalion) 05 Feb 1916 21 Son of Henry and Susan Ann Wellington, of Boohay Cottage, Kingswear, Devon. WILES Stanley Marwood Petty Officer 2nd Class 155727 HMS RESEARCH 28 Jul 1919 45 (RFR/P.O.A. 4202) Husband of Annie Wiles, of 2, Guernsey St., Portland. WOLFF Alexander - - - - - Born 20 Nov 1919 - Died 8 May 1941 - A Luftwaffe airman? YULE David Signal Boy RNR 1875/SB HMS IMPLACABLE 11 Apr 1919 17 Who accidentally drowned at Weymouth - Son of Mr. and Mrs. John T. Yule, of 52, Elm Row, Edinburgh. 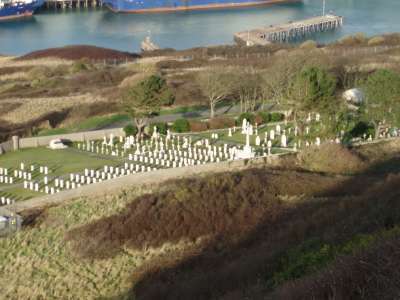 Sources: Compiled with the assistance of information given in the transcript of the Register of Interments in Military Cemetery, Portland, later known as the RN Cemetery, Portland: from the transcription of MIs for the RN Cemertery, Portland and from the Commonwealth Wargraves Site and numerous other sources.